Steve Bannon. The Oxford Union. A university that has been the breeding, sculpting and minting ground for British prime ministers for centuries and the Establishment. Here, Bannon, strategist of the Trump campaign in 2016, was in full swing, spearing his enemies and mocking the elite with an approach he has come to master. The audience was hushed, bewildered, even stunned. The thrust of his anti-elite argument was something that sat strikingly well with a figure he failed mention: John Ralston Saul. Saul was himself an investment manager and oil executive turned pure; he has reflected upon the failings of the system occasioned by an elite that has duped, gulled and hoodwinked entire nations, citing the value of rationalism filled by an “obsession with expertise”. They are, as Bannon reminded his audience, the party of Davos; they are the ones who prospered as bailouts were being dished out after the financial crisis of 2008-9, socialising privately made losses. They are, as Saul claimed, Voltaire’s bastards, the ones who hijacked reason to despoil societies in the name of an estranged technocracy. 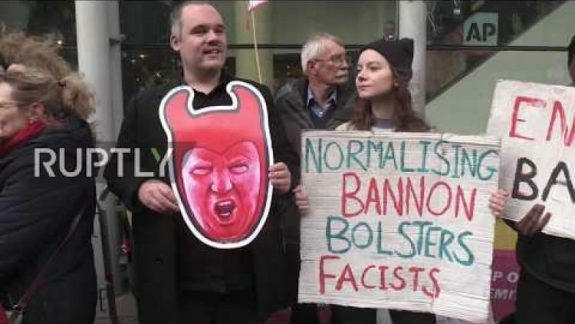 A rough estimate of 1,000 protestors had gathered; Bannon was himself smuggled into the talk “in the back of a police van” according to the Daily Mail. There were chants. “The police protect the Nazis!”; “Say it loud, say it clear, Bannon is not welcome here!” Two men happily goaded the protests in St. Michael’s Street, mimicking Nazi-style salutes and causing, according to the police, “alarm and distress to those who were present”. The address was peppered with the observations of a man who is now speaking to a political orthodoxy that has taken root in numerous states. “I did the original travel ban, it made our citizens safer. Zero-tolerance at the border is a humanitarian policy.” The view has been endorsed by both conservative and Labor governments in Australia since the late 1990s. Tossing about vague labels serves more to restrict discussion and confuse social symptoms rather than advance argument which is, ultimately, the aim of most regimes of censorship. Tagging alt-right and fascist to the Bannon show is handily reassuring for the ideologically closeted, but it betrays a convenient ignorance. For one, it resists an inquiry into the causes for the rise of Trumpism, and the broader Bannon agenda of a neo-nationalist international. Bannon is not in any conventional, let alone unconventional sense, fascist, but a sharpened reactionary attuned to the impulses of a malcontent. He is the perfect condottiere’s type, having become an adviser for the European, and generally global right, on those populist disruptions that now find shape inside and outside numerous governments. Some of these have an undeniable encrustation of neo-fascism. But the essential point here is hardly to shut them up and ignore them but rally with appropriate antidotes. Censorship, notably at such forums as the Oxford Union, would be a poor, and ultimately weak form, of combat. I have watched all of Bannon’s talk at the Oxford Union and he is a very dangerous man. Bannon is dangerous and he seemed not to convince any of the audience. He is talking pie in the sky. Industrial jobs will not go back to the US in numbers, nor will they come back to Australia GB etc. And the US will simply be unable to stop China from becoming a major world power. In the long run China will have an economy two to three times bigger than the US and any attempt to stop that will plunge the world into tension and danger. We have to find the ways and means to get along with China while hating it’s one party totalitarian state status. Bannon like Trump are simply symptons of some old ideology that has been re-branded and relaunched i.e. Nativism formerly known as eugenics (both class system and race) now coarsing round the Anglosphere of US, UK and Oz, plus middle Europe. The ideology or literature in the background owes more to the early ’70s Club of Rome (Rockefeller\Exxon Mobil, Fiat & VW) universe or bridgehead including ‘sciencey’ PR constructs masquerading as ‘liberal and environmental’ e.g. sustainability, limits to growth, carrying capacity (as cited by Sustainable Australia, Abbott and Morrison). In the US alongside this were related ZPG (Paul ‘Population Bomb’ Ehrlich, Paul ‘Sea Shepherd’ Watson and John ‘Passive Eugenics’ Tanton*, the latter white Oz policy admirer) sponsored by Rockefeller, Ford and Carnegie Foundations and ZEG or steady state economy via Herman Daly based on ‘limits to growth’ etc.. The bottom line is primacy of nation state, drawing line in the sand for wealthy male WASPs, anti-globalisation, border control, immigration restrictions, linking ‘population growth’ to environmental degradation, obsessing about nebulous NOM, withdrawal from trade agreements and blocs (so US corporates/govt. can play off smaller nations), import tariffs on goods, climate change denial and aversion to renewable energy sources. These constructs if fed via academia and media to MPs (AKA Mayer’s ‘media production line’) allows policy to advantage long standing players and precludes competition, or threats to future income streams. Tanton has also been credited with bringing together Nativist eugenicists with WASP Evangelical Christians, latter claiming to be pro life and anti abortion; Rockefellers with Sanger founded Planned Parenthood, but in background as opposed to pro life versus choice, as a method of control on feeble minded, minorities, non Europeans etc.